In mid-April we broke the news that Magnetic Press will be bringing works collected from Eisner and Inkpot Award-winning painter and storyteller Dave Dorman’s Wasted Lands universe. 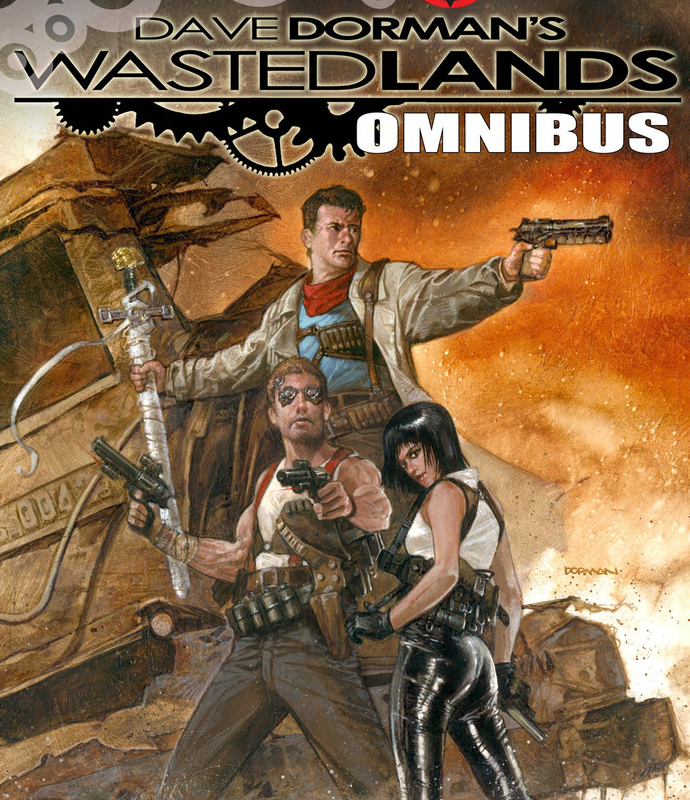 The hardcover collection will be released in July as Dave Dorman’s Wasted Lands Omnibus. Not only will we be getting reprints of the hard to find series, but new material, as well as an expansion of the world into other media, like games, and more online content. To get us prepared, we got a chance to ask creator Dave Dorman why he decided to bring back the series, as well as what we can expect going forward. Graphic Policy: For folks who don’t know, what is The Wasted Lands? Dave Dorman: The Wasted Lands is my creator-owned motorcycle western action-adventure story of good v. evil, set in a Sergio Leone-style world. The population has just survived The Iron Wars, a game-changing event where eight greedy rail barons fought for control of The Wasted Lands territories, plus the urban setting of Mortal City. The rail barons now rule over this toxic, polluted world devastated by the industrial apocalypse their own greed created. Like any war-torn land, our citizens have lost all hope. Our heroes are given a quest to rebuild hope and restore their world to its original glory. GP: How did the series come about, what were some of its influences? DD: The Wasted Lands started out as the creation of a world included in a computer game called Skybox: Into the Vortex. The characters I developed eventually morphed into what became the genesis of the RAIL: Broken Things graphic novel, based in The Wasted Lands. In addition to my love for Sergio Leone movies, The Wasted Lands is informed by my personal interests – railroads, motorcycles, surfing, politics, religion, fantasy, science fiction and history. GP: The series has been out of print for a bit, why bring it back now? DD: Unfortunately, the series had some rights issues with its previous publisher, so I discontinued it until all rights had reverted back to me. When those rights finally reverted back, I had personal and professional obligations that disrupted my ability to continue the story. During those years, since the first publication of the RAIL graphic novel, many fans have asked me for more stories. I always intended to do a five graphic novel cycle to tell the story of Edge and his quest. Over this time, I continued developing the stories and the characters, waiting for just the right opportunity to publish. A recent turn of events has allowed me to continue working on this project in earnest, and I am continuing Edge’s quest. This summer will see the release of The Wasted Lands Omnibus, a large collected volume featuring a completely remastered version of RAIL and other material opening the world beyond Edge’s quest. I’m very excited to see fans being reintroduced to The Wasted Lands, and even more excited to continue of this epic adventure. GP: How’d it come to Magnetic Press? DD: Magnetic Press’ publisher Mike Kennedy and I have known each other for two decades, and have often spoken of working together on a project. This opportunity sparked when Mike formed Magnetic Press. Mike was always a fan and supporter of RAIL and wanted me to complete it, so he brought these suggestions to me, and I jumped at the opportunity to finish what I started so many years ago. GP: In the announcement, there’s mention of new material. Hints as to what we can expect as far as that? DD: The material that we have added to this Omnibus will help the reader experience the broader story of the characters involved. Most of the material I produced for various small publishers after the RAIL graphic novel was first printed. However, this material was generally lost to the fans, who found it hard or impossible to find. Mike suggested offering all of the material together for the first time in one place. I concurred that it would help the fans see the bigger picture of The Wasted Lands saga. The Omnibus material includes continuous panel comic style storytelling, as well as text novellas with full-page, painted illustrations. There is also some archival information describing the genesis of The Wasted Lands and its characters, and how these stories relate to each other. GP: In the announcement, there’s mention of an expansion of the universe into online content, and games. Can you speak more to that? DD: I have three text novels that we will be releasing as eBooks, featuring major characters from the storyline and I will be offering other graphic material via digital downloads. We are developing a strategic board game and collectible trading card game titled WASTED LANDS: IRON WARS with company Silent Gunfight. It is a railroad game similar to RISK, based before the events of the RAIL graphic novel. The trading card aspect will continually make the game more playable in the months to come. Also in the works is a quick-play card game based on an upcoming Mortal City surfing adventure called RED TIDE. We hope to premiere this card game as well as the first episode of the RED TIDE story at San Diego Comic-Con. We have online content and games in development, which we will be talking about more fluently in San Diego. We are working closely with our business partner and producer Scott Faye and entertainment attorney Adam Sher on these properties. GP: Where did that idea come from for additional content? DD: It was always my plan open up The Wasted Lands to transmedia opportunities. While I was creating the world, I realized I had populated it with some really fun and fascinating main and secondary characters. If I were a fan, I’d want to see more of these characters. I realized they could never be expanded upon properly within the confines of my RAIL graphic novel five-book series. Through other media, I can share these ancillary adventures outside of RAIL’s linear story line. GP: Can we expect new adventures set in the Wasted Lands world? DD: The RAIL graphic novel series will continue with at least one volume per year until I finish that storyline. I will capitalize on the other materials–text, stories, ebooks, games, other transmedia–over the next few years. I am devoting myself to working nearly full time on more of The Wasted Lands adventures. GP: You’ve done work for comic companies, game companies, covers, trading cards, and more. Is there any difference to how you approach your art for each? DD: Each project’s demands directly relate to which genre I’m working in. I am flexible visually and through technique, so that makes it easier to move from one project to the next, almost seamlessly. Since I am a single illustration cover artist, my friend Christopher Moeller gave me a great tip on doing the sequential art, which was always a struggle for me. He suggested I treat each panel as a piece of single illustration cover art. Once I retrained myself to think that way, it was easier to do sequential art. This creative muscle I’ve built up over the years helps me build a cohesive continuity through all of the products released. I’ve been very fortunate to have such diversity in my previous work and I look forward to sharing the experience I’ve gained in making The Wasted Lands an unforgettable place to visit. GP: What else do you have coming up? DD: One of the things I’ve been looking most forward to at this point in my career is producing some personal work that I’ve been putting off due to being so busy with commercial work. The Wasted Lands is my top priority, but I have been able to take the time to do a number of large gallery type paintings, including a Captain Nemo series of pieces I plan to premiere in San Diego as well.